PARIS (RNS) — Avenue Hoche, one of the tree-lined roads radiating out from the Arc de Triomphe in Paris, seems like an ideal place to locate a church for foreigners. An oasis in the city’s chic 8th District, it’s close to the Champs Élysées and the pleasant western neighborhoods that expats prefer. But that location also put the street in the middle of France’s often turbulent politics, as St. Joseph’s, the parish for English-speaking Catholics in Paris, has learned several times since it opened there in 1869. The “yellow vest” protests rocking the French capital for the past four Saturdays have filled Avenue Hoche with roving bands of angry demonstrators and riot police firing volleys of tear gas to disperse them. More protests have been called for this weekend. Parked cars and motorcycles have been burned to the right of the church entrance. The supermarket to the left was looted. Protesters have at times taken over the church’s backyard or sat down on its front steps and plaza for a rest. During the past four weekends of protests, though, St. Joseph’s has stayed open, holding all its scheduled Masses, four baptisms and a short Advent retreat. A youth group prepared 200 lunch bags for the homeless and went to distribute them with wet handkerchiefs over their noses against the tear gas. Blocked streets and closed metro stations mean attendance has fallen off somewhat, but parish life has gone on. Some parishioners who couldn’t get to church followed services on its YouTube channel. The Rev. 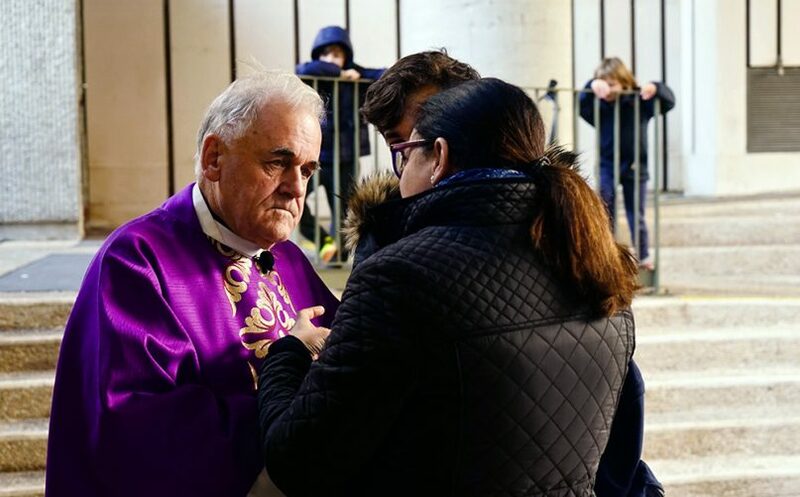 Aidan Troy, the Irish Passionist who has headed St. Joseph’s since 2008, faced a sparse congregation at early Mass on Dec. 2 after the worst rioting of the protest series went late into the previous night. He drew on an Irish saying — “This is the morning after the night before” — as he thanked worshippers for coming, noting that some of them might feel on edge due to the protests. 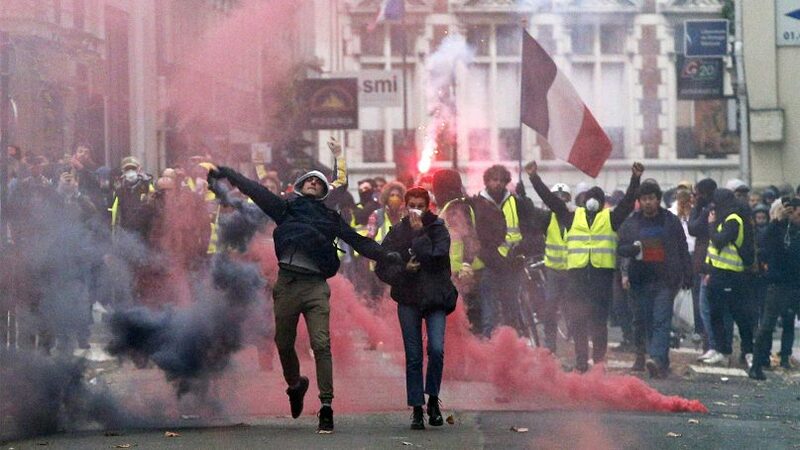 The yellow vest protesters, many of them rural working poor facing rising taxes amid stagnating wages, have brought their grievances to Paris and forced the government to roll back some planned tax increases. Among the thousands of protesters have been hundreds of local anarchists who donned the same vests to melt into the crowds and then loot, burn and clash with police. Some angry yellow vesters joined in the violence and, especially on Dec. 2, the police were clearly overwhelmed. Almost twice as many security forces turned out on Dec. 8 and stood their ground, but central Paris was still paralyzed. Parishioners who’ve managed to reach St. Joseph’s often found blocked streets and closed metro stations along their way. Organist Daniel Morales-Carmona crossed police lines on Dec. 1 to play at the Saturday evening Mass, but the metro stopped four stations away from the Arc de Triomphe the following Saturday. He had to get out and walk the remaining distance. Morales-Carmona soon came upon rock-throwing protesters and riot police firing volleys of tear gas, and ran for cover. “I looked at my phone and I had five minutes to make it to church. That was impossible, so I had to turn around and go home,” said Morales-Carmona, a native of Mexico doing advanced organ studies at the Paris Conservatory. Tear gas has hung over Avenue Hoche for the past three Saturdays as riot police tried to break up roving bands of protesters gathering there. The Arc de Triomphe is only about 300 yards away, and yellow vesters reached it on Dec. 2 to spray graffiti on the monument’s walls and trash a small museum inside. When protesters took over the churchyard one Saturday and began relieving themselves there, Troy opened the toilets inside St. Joseph’s and invited the demonstrators — especially the women — to use them. “That probably protected us from any damage,” he said with relief while standing near a sliding glass door that could have easily been shattered. St. Joseph’s first brushes with French politics came a year after the Passionist order opened it in 1869. Artillery shells often fell in the area as the Franco-Prussian War and then the Paris Commune insurrection raged. Once peace returned, the church settled down to serving parishioners ranging from wealthy English and American expatriates to their Irish maids and assorted other English speakers lured to the booming City of Light. A day before his death in 1900, the Irish playwright Oscar Wilde, who moved to Paris after two years in jail for “gross indecency” (i.e., a then-banned homosexual relationship), called for a priest from St. Joseph’s who received him into the Catholic Church. An anti-clerical government almost shut the church down in 1900 by sending an enormous tax bill that a rich American benefactor unexpectedly paid. The government expelled the Passionists a few years later, but the order was eventually allowed back if it repurchased the building. During the 1940-1944 German occupation, English priests had to leave but clergy from Ireland, which was neutral in World War II, were allowed to stay at the church. The Gestapo carted off many of its files and kept a close eye on the church. Despite this surveillance, two Irish Catholics with ties to the church — the Rev. Kenneth Monaghan and governess Lilly Hannigan — succeeded in secretly passing messages to French Resistance groups and helping smuggle downed Allied airmen back to Britain. The old church building became unstable in the 1980s, prompting the Passionists to open a new structure on the same site in 1987. 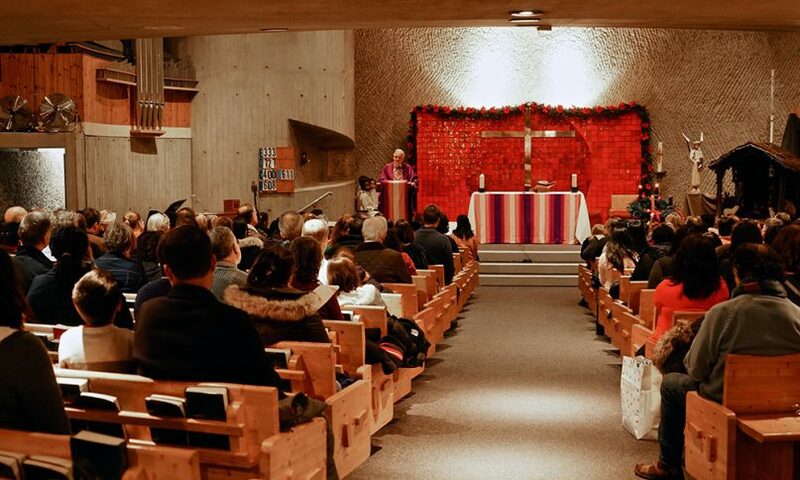 By that time, the parish had become the multinational community it now is, with large numbers of new parishioners from the Philippines, Sri Lanka and several African countries. The congregation now is made up of some 2,000 Catholics from about 40 countries. “St. Joseph’s has been and will always be my home away from home,” said Jun Gonzales, a health care worker who moved from the Philippines to Paris five years ago.